There’s a supplicant from the Navaho Nation. A few from the now-defunct faith of Judaism. There are Roman Catholics. There’s at least one Hindu. Mormons are represented, as are Baha’is of the United States. Islam and Sikh’s will be there. Episcopalians, Greek Orthodox, Presbyterians, independent charismatics, and Buddhism have a place in the line-up too. And, because no event of ecumenism could possibly be complete without them, so too will Southern Baptists be involved. 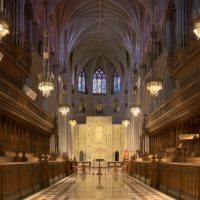 The Washington National Cathedral is the site for the “interfaith” prayer service that is to be held the day after the inauguration. Many high profile evangelicals have been involved in the event during recent history. In 1985, Billy Graham preached a sermon at Reagan’s inaugural service. Since then, the likes of Foursquare’s Jack Hayford, Soujourners’ Jim Wallis, and North Point’s Andy Stanley have all stood on the dais.